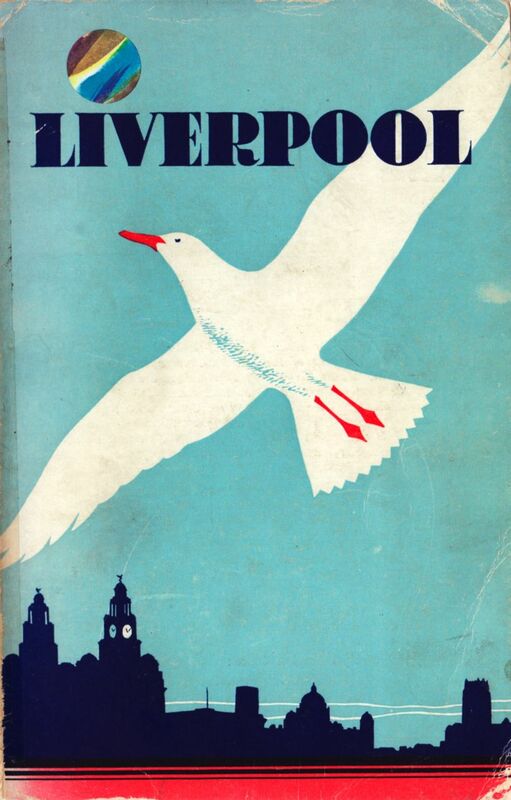 I’ve mentioned my collection of Liverpool books before, and I thought today we’d take a close look at one in particular. 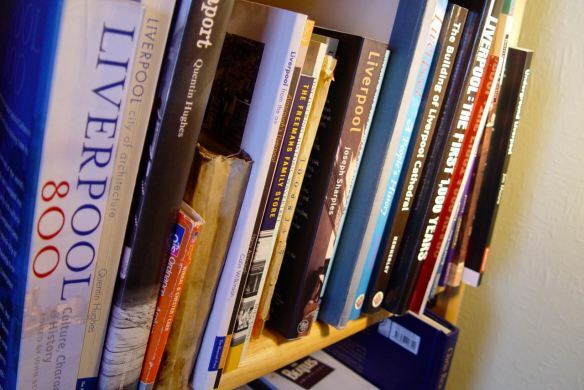 At home, the Liverpool books and maps. 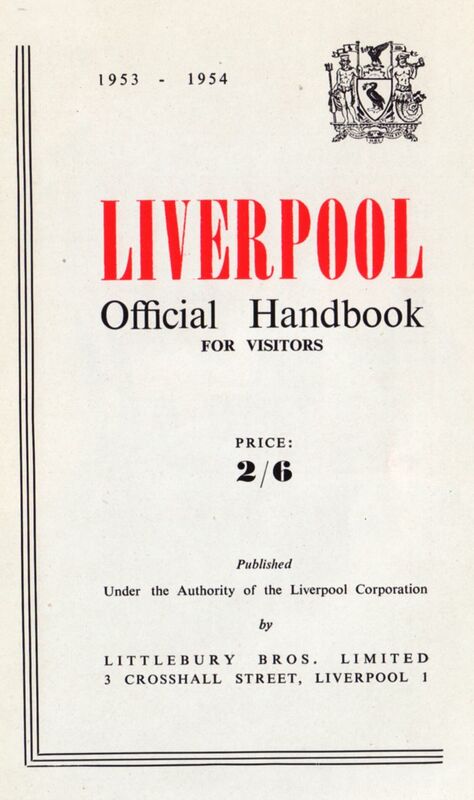 And the one I want to look at is the ‘Liverpool Official Handbook For Visitors’ From 1953 – 1954. Produced not long before I was born, most of this looks like a guide book to a different planet. Yes, that’s our original ‘a sense of place’ logo stuck on the front there. This obviously used to come out on gigs with us. Graphic design was in its infancy then. Oh, so that was ok then was it? Some of the differences to now are more subtle. 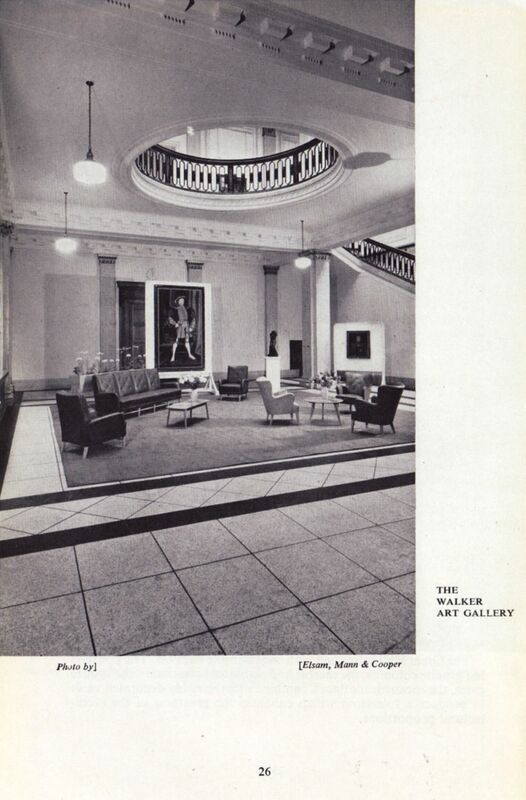 In those days, for example, we clearly didn’t expect all art galleries to be cafés too. The Walker, in 1953. A ‘stylish’ reception area, not a café. And up the hill, the Anglican Cathedral was still twenty five years away from completion. And still had older housing clustering around it. One of very few appearances of ‘the people of Liverpool’ in this Guide. 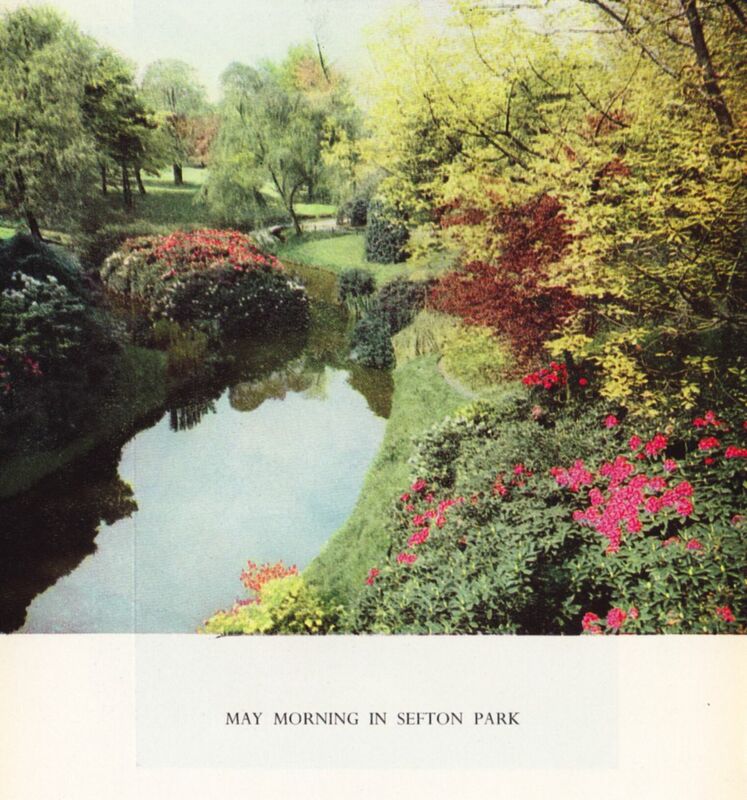 And then suddenly a picture of somewhere that’s had its ups and downs since, but is now coming back to its best, the beloved park. Then more shipping. Mention is made of the damage to the docks during the war years still needing to be repaired. 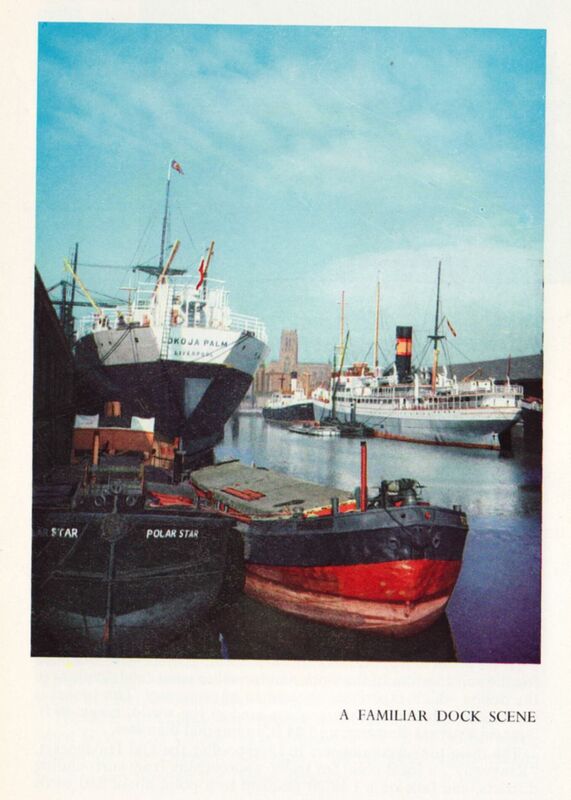 But there is no suggestion yet that these are most of the docks late years. 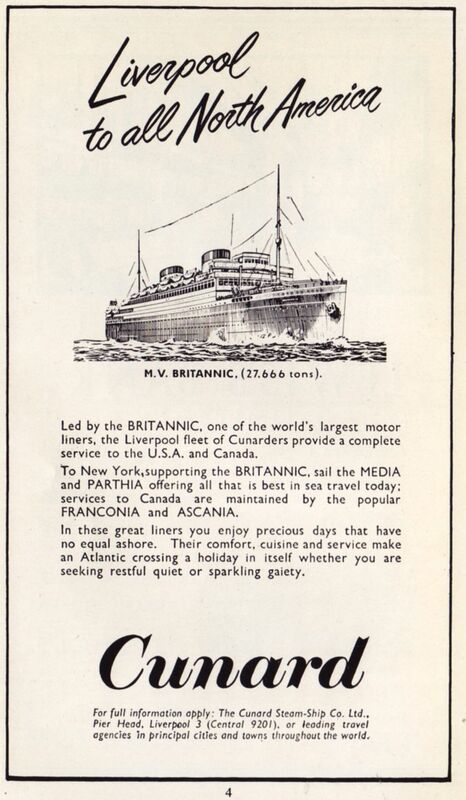 We are simply told ‘Liverpool – greatest export port in the UK.’ So there. 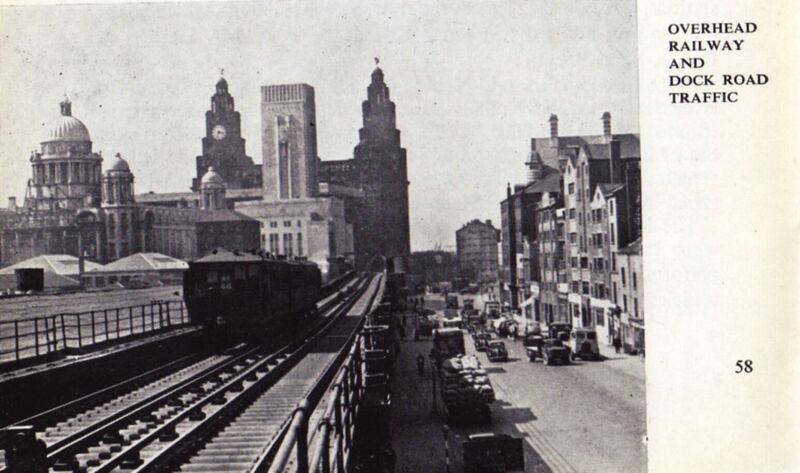 We’re also told that the best way to see all of the docks is from a trip on the Overhead Railway. No mention that within three years this precious wonder of the world will be gone. Staying with transport we’re next taken into the Mersey Tunnel, to see the traffic lights! 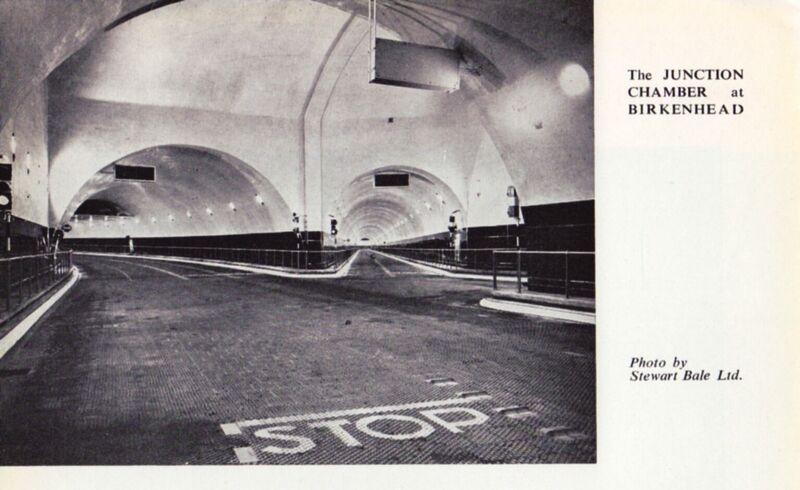 Yes, those days both ends of the tunnel had a ‘Dock’ entrance and exit. Though we the people don’t feature much in the book, we are urged to care for our health by doing more swimming. A total of twenty three public swimming baths are listed. Anyone remember ‘Burroughs Gardens Baths and Wash-house, Liverpool 3’? 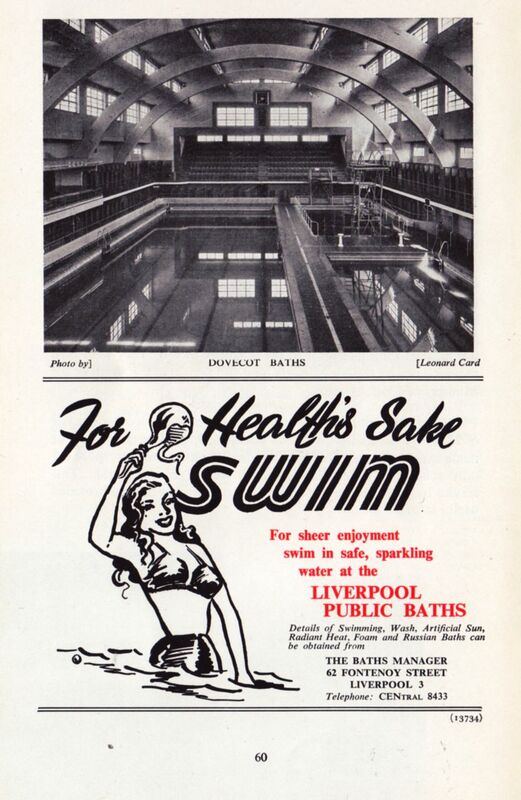 Or ‘Netherfield Road Wash-house and Slipper Baths, Liverpool 5’? 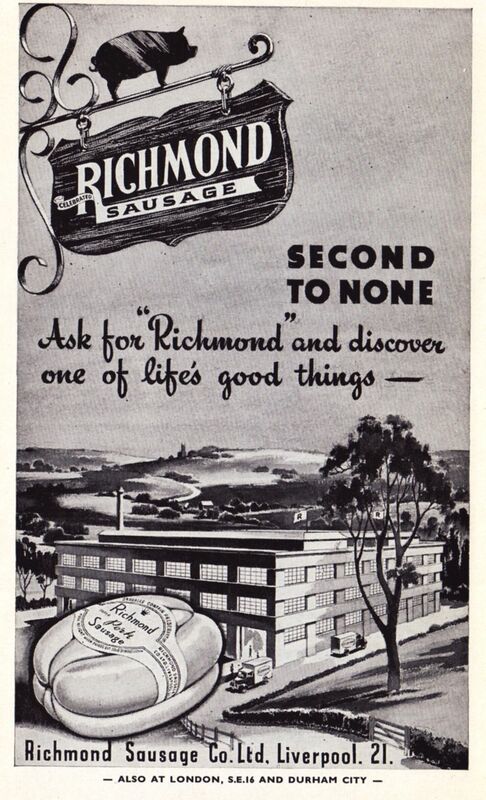 And, finishing on a flourish, one of the great joys of the book, the adverts. This was as posh as you got. I can still smell the coffee from there now. In the leafy lanes of Seaforth, with the rolling hills of Litherland and Bootle in the background. And though we don’t yet have things calling themselves social enterprises, we do have the Co-Op. And some people in Liverpool ‘have not yet joined’! Which brings us up to about now doesn’t it? Never mind, at least we’ll always have Lewis’s. Won’t we? I really enjoyed this, Ronnie. 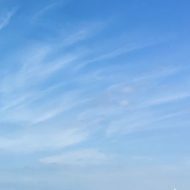 Brilliant photograph of the Cathedral. Welcome Bridget. People have also commented elsewhere on the Cathedral picture, and I can just about remember those buildings when they were empty and derelict, years later. When the Cathedral tendered the job for creating new buildings in front of the Cathedral, in the late 1980s I think, I remember them specifying that they were looking to recreate this feeling of the great cathedral arising from amidst the town that surrounds it. Don’t think they quite succeeded, as they put Cathedral Close too far away from the building, to allow car parking. Incredible photos with a trip down memory lane. Thanks Jan, good to be able to put them on here, rather than just sit on a shelf in our house. A lovely post, which brought back plenty of memories. Like yourself my first impressions of old Liverpool would have been towards the end of the 50’s, my dad would take me on Sundays down to the Pier Head to see the ships. 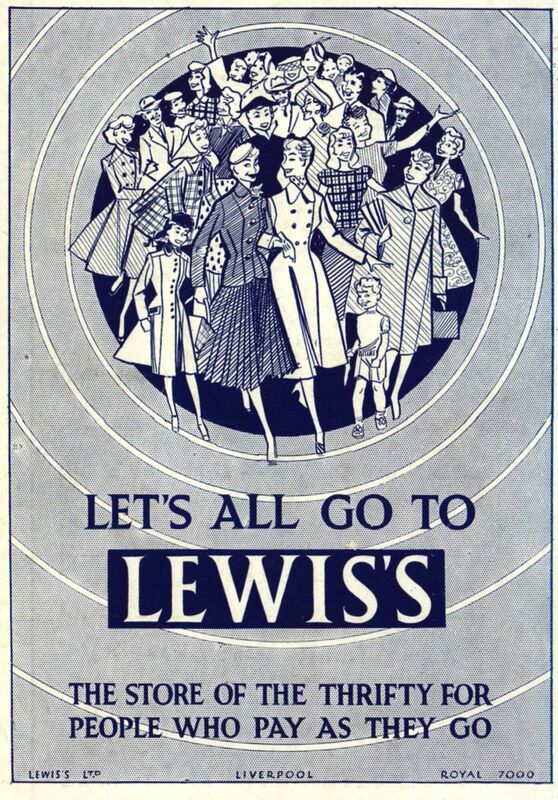 Shopping trips in ‘town’ would always include a trip to Lewis’s (‘the store of the thrifty for people who pay as they go’)….they don’t write advertising slogans like that anymore, do they ! Although I don’t remember our mums being as fashionably dressed as the ladies on their advert. Mention Coopers to anyone of a certain age and it will always bring the response ‘If I close my eyes, I can still smell the coffee even now’ The other all-pervading smell of course was from the Higsons Brewery. Was it Lewis’s or Blacklers that had the huge rocking horse by the lift on the second floor ? Books were bought from Phillips, Son and Nephew on Whitechapel, opposite NEMS. My nan worked for decades in the Co-Op on Walton Road, I can still remember the system of wires, pulleys and screw-top containers by which payment was transferred to the cashiers in the basement, and change returned with extaordinary speed. Do you remember the obligatory treck from the old St Martins school premises on Stanley Road to the smelly, crumbling old baths in Balliol Road for swimming lessons ? The changing cubicles always had at least one pair of old sodden swimming trunks under the bench. ‘Safe, sparkling water’ ? If I close my eyes I can still smell the chlorine ! Hi Barry, Glad you liked the post. I don’t think I ever saw anyone in Lewis’s looking like the women in the advert. And in my memory the rocking horse was in Blacklers. And I’ve only just finished counselling to get over the Balliol Road Baths. The next Liverpool Guide I’m going to feature is the very first one done, from 1820. That’ll challenge even your memories! Please, please do the 1820 guide ! 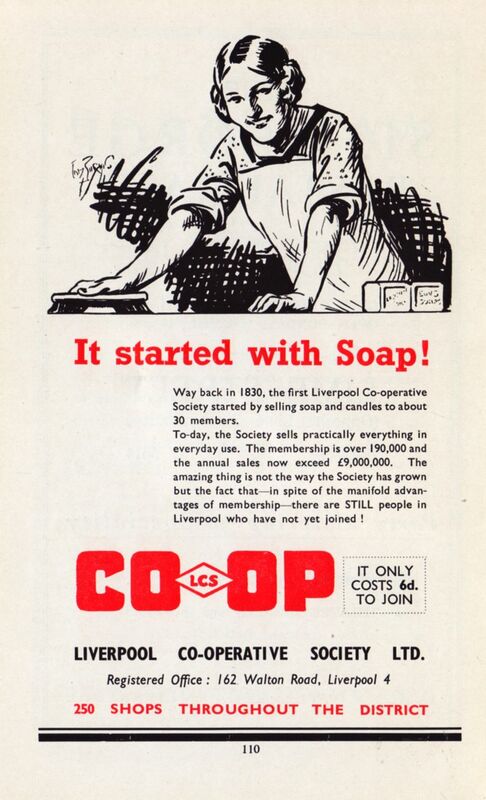 Although this 1950’s world is set in Liverpool it could just as easily be the world I was growing up in on the other side of the world.And in the 1960’s there was still a Co-op across the road from the public library where I worked. 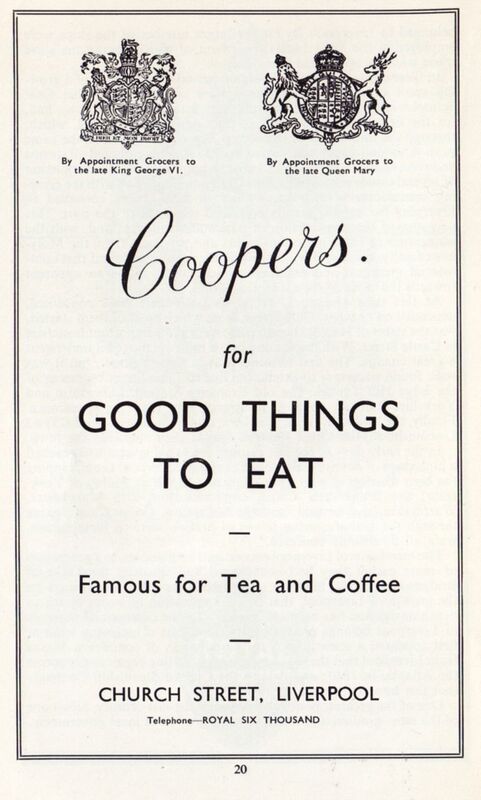 There was a grocer’s shop that displayed Royal arms and coffee shops whose coffee I can still smell today. The swimming baths were dank and smelled strongly of chlorine and one probably ran the risk of contracting tinea from the change-room floors. Fascinating stuff ! Sometimes it is hard to believe one actually lived in that world. 1820 will soon be with us. 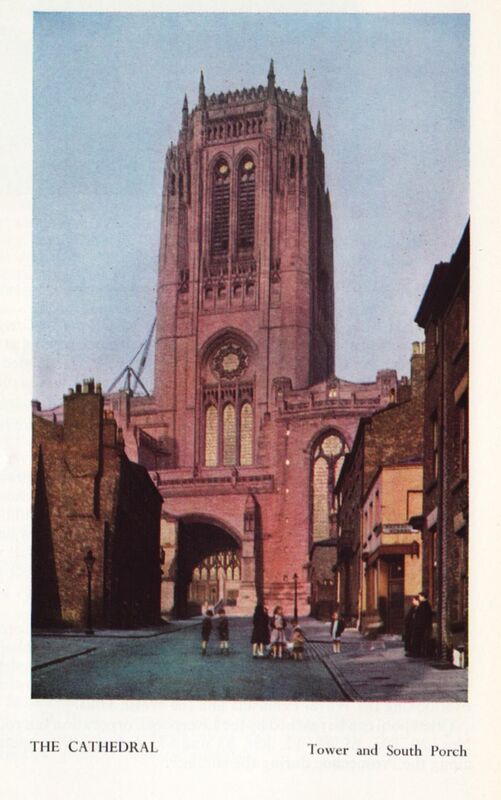 Just need to get around Liverpool and photograph a couple of places illustrated in the guide that haven’t much changed! And yes, I’ve often watched films of Australia in the 60s and thought it looked like England with desert and kangaroos – Skippy, I mean!